Thanks to development, the new part of Langkawi’s Pantai Cenang looks absolutely nothing like it did just five years ago. The plus side of this is that the place definitely looks alive and open for business, regardless of the season; but it also looks and feels a bit chaotic at times. 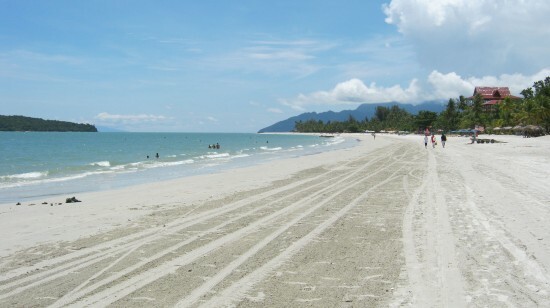 The stretch of road that lies south of the island’s international airport and past a go-cart track leads into the main stretch of Pantai Cenang and the adjacent two-kilometre-long stretch of whitesand beach has historically been one of the more popular Langkawi beach destinations for a variety of travellers on a variety of budgets. 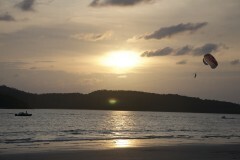 Yup, a long stretch of white-sand beach awaits you. ‘New’ Pantai Cenang includes a new mall complete with a Guardian Pharmacy, The Loaf Bakery, an Old Town White Coffee and even a Starbucks — this in addition to the new McDonald’s at Underwater World. Yes, times they are a changin’. The entire length of road here is basically jam-packed with souvenir shops, spas, mini-markets, clothing boutiques, eateries, a few pub-type establishments and a slew of places to call your home-away-from-home. You can either take the sidewalk scenic route, or just saunter down the beach popping into civilization at your leisure. Surprisingly the beach isn’t too crowded, but there’s a definite rise in the population in the cooler late afternoon hours. A variety of accommodation choices are on offer and if you do your homework you can score some great deals, particularly if you don’t mind walking a little further to the beach. A small road directly across from Orchid Ria Restaurant boasts several well-established budget accommodation. Daddy’s Guesthouse is a funky little establishment with a true beach town atmosphere. 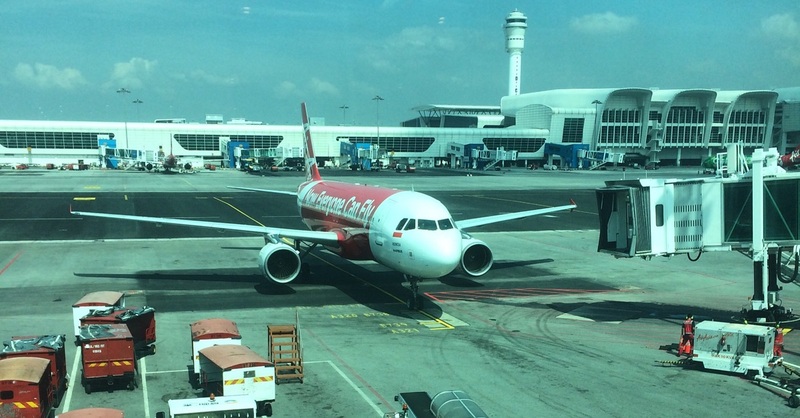 Its 12 air-con rooms go for 50 to 70 ringgit a night. Friendly reception team at Daddy’s Guesthouse. 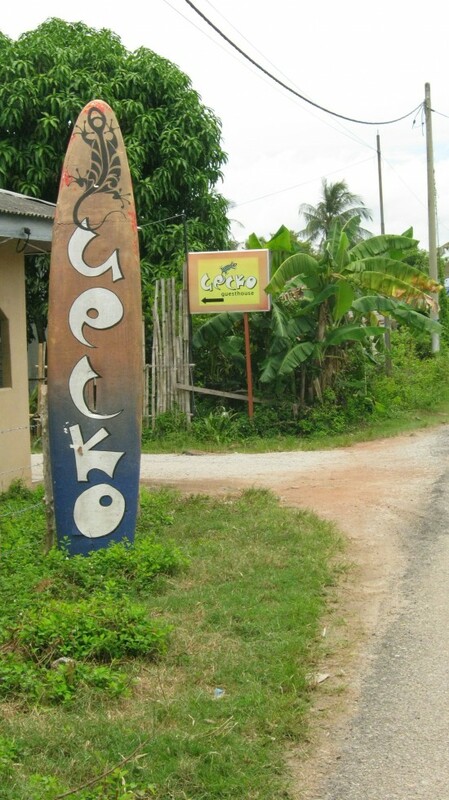 Gecko’s Guesthouse, a little further down the narrow road, is easy to see with its recycled Windsurfer sign out front. Gecko’s truly reflects the Pantai Cenang of years past. The dorm rooms are 15 ringgit with air-con and another 28 rooms are scattered around the complex, ranging from 35 ringgit with fan and shared bath up to 80 ringgit for the deluxe room with air-con and breakfast. 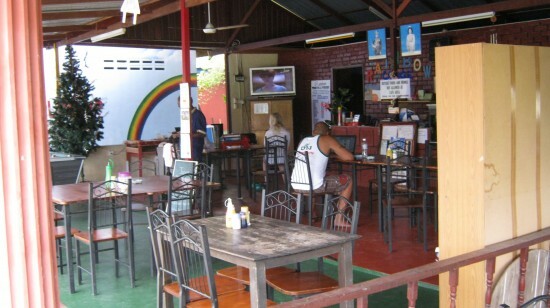 Gecko’s is one of the original guesthouses in Pantai Cenang. 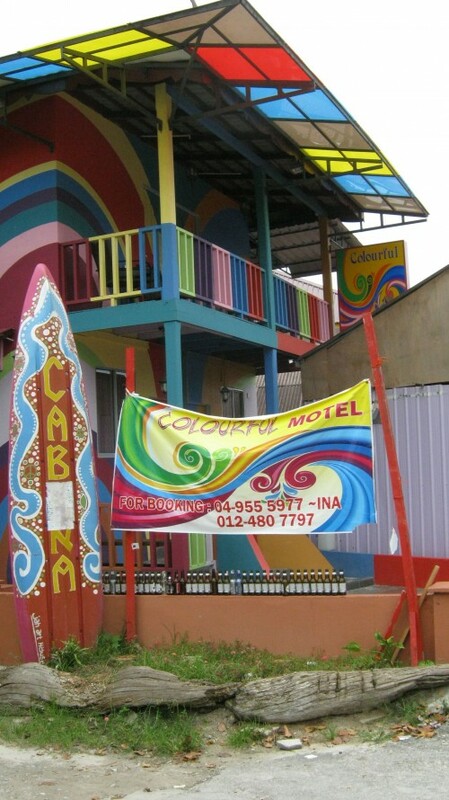 The newest addition to this area is the Rainbow Lodge, which has its own beach style, with a buzzy restaurant lounge and dorm rooms starting at 20 ringgit, plus 30 rooms starting at 40 ringgit and going up to 80 ringgit for a deluxe with air-con. 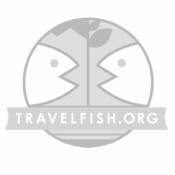 These three establishments truly set the feel for this area, attracting a diverse range of travellers. Start your day with a rainbow! Those who want to stay on the beach itself have to pay more of course. 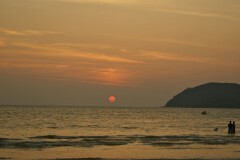 The Melati Tanjung Motel offers rooms for 120-160 ringgit, all including TV, WiFi and mini-fridges. Other hotels on the beach in the same price range include the Cenang Rest House starting at 100 ringgit and the Langgura Baron Resort starting at 120 ringgit. Looking for something a little more upmarket? The Beach Garden Resort, located on the beach starting at 255 ringgit, has a great open-air restaurant and bar for dining with your feet in the sand. Casa Del Mar and the Pelangi Beach Resort are both on the north end of the beach and have excellent facilities, with rooms starting at 800 ringgit and going way up. T-Jays is across the street from Underwater World. Jalan Pantai Cenang has so many restaurants and dining options it’s difficult to highlight just a few. Wandering down the road you can feast on street food or live it up with some five-star dining. A great place for breakfast is Bella Cafe, with an English breakfast from seven ringgit, roti for .80 ringgit and a nice baguette sandwich for 8.50 ringgit, is one of the best deals in Pantai Cenang. Though a bit difficult to spot, it’s across from the Colourful Hotel, which is definitely not difficult to spot. Can’t miss Colourful Motel landmark, complete with beer bottle collection. Another great budget restaurant is the Hasi Kandar Tomato with a daily buffet of Indian/Malay and serving roti all day and late into the night. Orchid Ria Seafood, T-Jay’s Bistro & Pizzaria, The Brassiere and the upscale Cliff Restaurant are just a few of the dozens of dining establishments well worth the ringgit. Laman Padi isn’t just for the agro-tourist. As far as sightseeing goes, Underwater World is actually much more interesting than it may sound and they also have air-con, so it’s not a bad choice on a sweltering day. The entrance fees vary a bit, but adults (over age 12!) will pay about 38 ringgit, and kids are 28 ringgit. 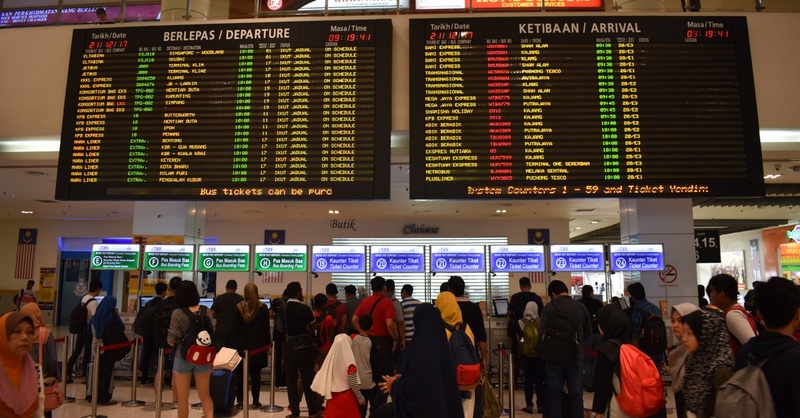 It’s also next to three large duty free shops and the only ATM machines in the area aside from the nearby airport, but new Maybank is pending at the mall. The Laman Padi Museum is also located in Pantai Cenang and definitely worth stopping by — plus it’s free. Located directly across from Pelangi Beach Resort, this informative museum is all about rice. 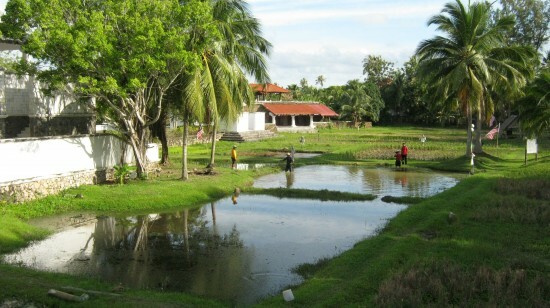 Not only do they actually have some active paddy, visitors are given a hands-on opportunity to plant rice. There’s also a spa and Laman Ria Japanese Restaurant within the compound. And yes, they also sell soul food! Shopping options abound on Jalan Pantai Cenang. In addition to the modern mall, there are duty-free shopping spots, well-stocked minimarts and souvenir shops; although your eyes may glaze over at their numbers, some are worth investigating. And of course, for the actual beach lovers… there’s the beach itself and all that busy Southeast Asian beaches generally have to offer, from jet skis to inflatable banana boats. 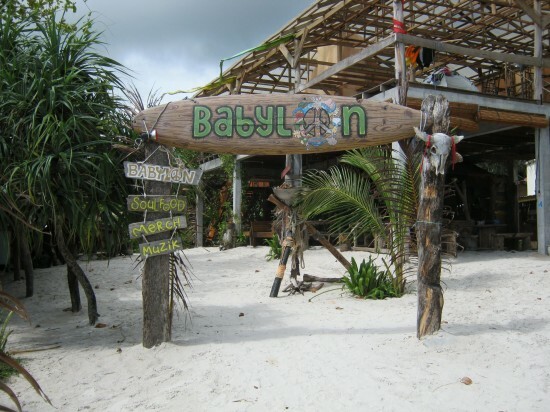 A variety of cafe and pub-type places will help you get into your island groove (complete with reggae music), such as Babylon, Rafii’s and Yellow Cafe. The new Pantai Cenang is bringing a more modern feel to the main drag, but there’s still the some of the original groovin’ beach scene of years past… It’s the best of both worlds.